Hello! This past weekend I finally managed to set aside some time to make some back to school teacher gifts. OK, so this is Sabrina's 5th week of school already, but better late than never, right?! For awhile now, I've been wanting to make some corner bookmarks. 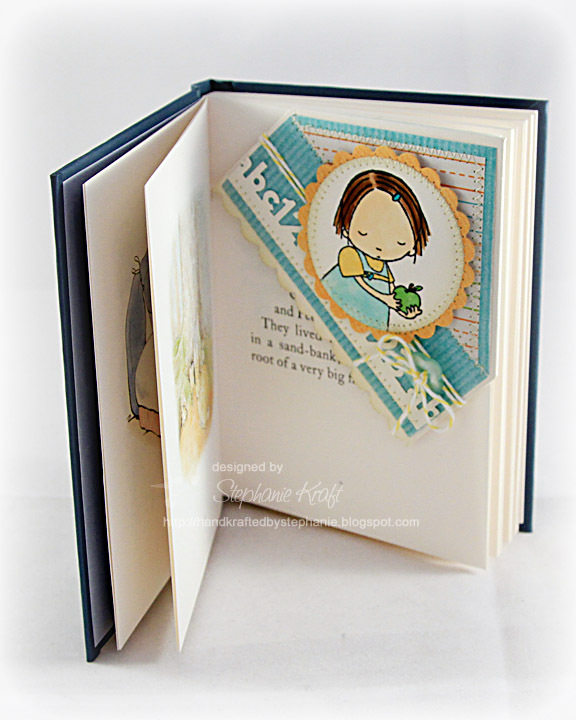 Beate has a fabulous tutorial here. And, Denise, in particular, has been inspiring me with her fabulous bookmarks here, here and here. I thought that a bookmark would make a nice little gift. I decided to make identical ones for some of Sabrina's teachers and para aides. I knew that I wanted to use the sweet Pure Innocence stamp, Apple For You, from My Favorite Things. I wasn't sure what papers I wanted to use until I opened my email and discovered that Zoe Pearn had released a new collection called School Days (available at Sweet Shoppe Designs). It was perfect timing as I adore all of Zoe's sweet designs. Plus, the fact that the papers are digi meant that I wouldn't have to worry about running out! Accessories: Standard Circles-Small and Standard Scalloped Circles-Small Nestabilities (Spellbinders), ABC123 border punch (Martha Stewart), Scalloped Scallop border punch (EK Success), Button (Papertrey Ink), Divine Twine (Whisker Graphics), Foam tape, Thread, Sewing machine. This is darling, Steph! 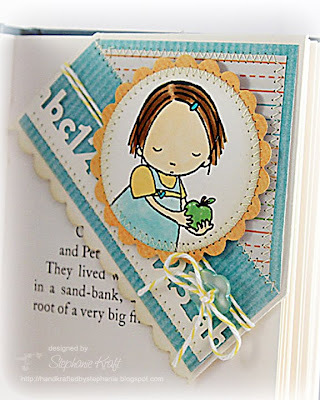 I've been dying to make one of the corner bookmarks, too!! 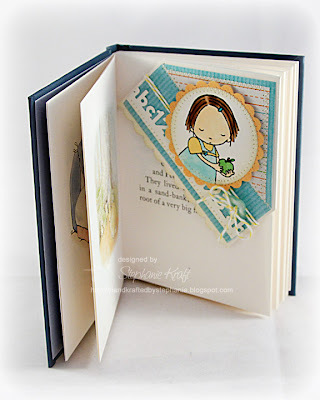 Fabulous design and such a sweet image! Love those images! Great idea for a bookmark. Stephanie, this is adorably beautiful! Great design and the colors are very striking! Great coloring and the ruled dp, textures, sewing, and accenting make for an amazing detailed teacher gift! I need some of these PI girls. Are you using the MFT dinamics impressions to get the grosgrain effect on the blue shade? I may need that! Beautiful! Awe! What a sweet lil' book marker! Too cute Stephanie! Love the color combo! The coloring is wonderful too.